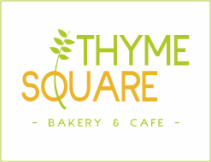 ﻿Thyme Square is proud to present the ONLY artisan bread bakery in over 100 mile radius. All of our hand-made breads are baked first thing in the morning and are available in either single servings or loaves (where applicable). a long thin loaf of French bread distinguishable by its length and crisp crust. artisan white bread made of traditional poolish, flour, water, salt & yeast. bread made with whole wheat flour & local, whole, unprocessed grains. naturally leavened using the same local starter from when we first opened! soft, leavened quickbread made with buttermilk & aged cheddar. Made fresh daily. Selection changes regularly; please ask your server to describe the dish our Chef has prepared for you today! House-made, gluten-free, baked meringue cookie stuffed with a delicious butter-cream or chocolate ganache filling. Buttery, flaky, hand-made croissant stuffed with rich, dark chocolate. All of our ice cream is made in-house using fresh milk & cream. Seasonal flavors will be based on the availability of local products.